I’ve always wanted to say that on a post. Don’t you just love the title of Michele’s blog? I want to live in a world where every woman wakes up-first-thing-in-the-morning hearing those words. HEL-LO Lovely….and then you would yawn and stretch in your silk pajamas and whisper,”Yes dahhhling….I do want my coffee with cream this morning.” And BAM, there it is, hot and steaming on your bedside table, right next to your fresh flowers. 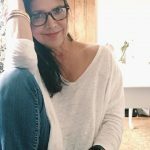 In case we haven’t met yet, my name is Leslie and I blog at Gwen Moss–and depending on the day you visit you might find me cutting planks for one of my rooms or tearing up an old pallet to make a rustic Fall tablescape, or I might be talking about your dreams and how you can be your own damn hero. I do that a lot on my blog. I start –what I think– are interesting conversations with my readers and then I get totally blown away by their wise and insightful comments. Of all the things I do on my blog I’m actually most proud of my comment section, and all those women who take the time to share their real life perspectives with the world. Ok. This might be the moment I admit that my husband thinks I’m channeling Lucille Ball through my veins although in all fairness he loves Lucy. But this also means I don’t exactly ooze ultra-coolness like those gals you might admire from afar. Well, maybe if you’re reaaaally far. My own background includes a Masters in Marriage and Family therapy but those were years spent primarily working with women who were struggling with their self esteem and their bodies. Eating Disorders was what you saw from the outside, but at its core it was really about identity. About knowing your deepest Self–separate from what everyone else thinks or wants from you and embracing it all. It was also a struggle about “being enough’ that I could personally relate to…and still pops up regularly. Like this time I was in my Yoga Teacher Training class. I tell you all this as a way of saying that—after all those years in the session room, I still carry those women’s stories inside me. In the same way you’re walking around with your own powerful life stories that made you the person you are today. And so I write because I’m curious about life and you and how we might connect. But that’s a conversation for another time because today I’ve come with a little hostess gift. You know how you get invited to a nice dinner and you try to come up with a hostess gift with a personal touch? Well that’s what I did when I thought about visiting Hello Lovely. I thought, “What would Michele and her readers like? 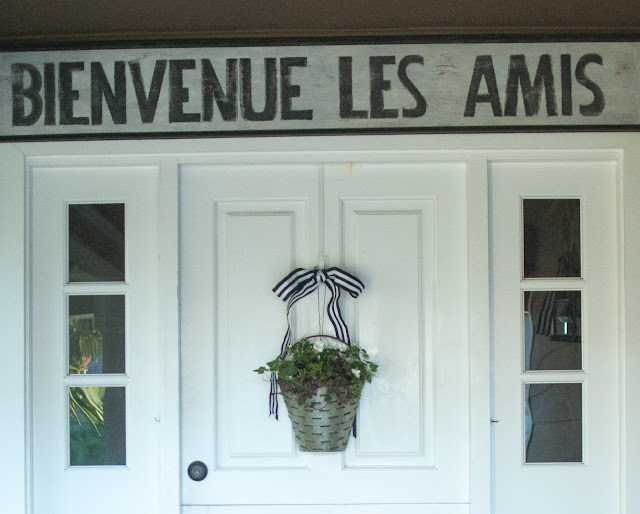 And so today I’m sharing 3 ways to add French charm to your Fall front door. 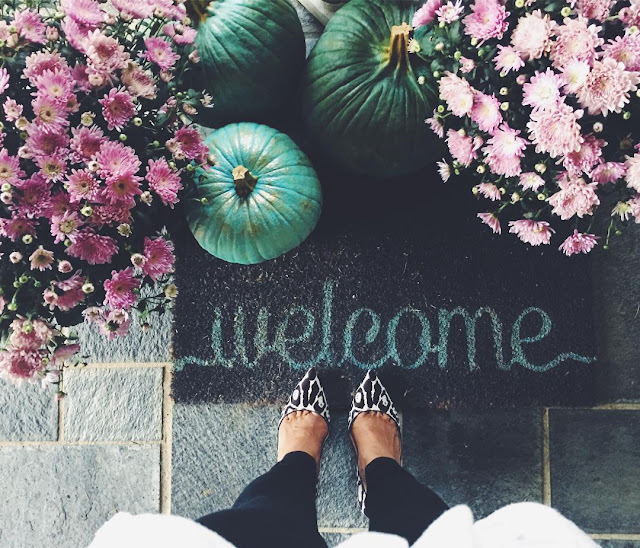 Have you decorated your front door or porch yet? 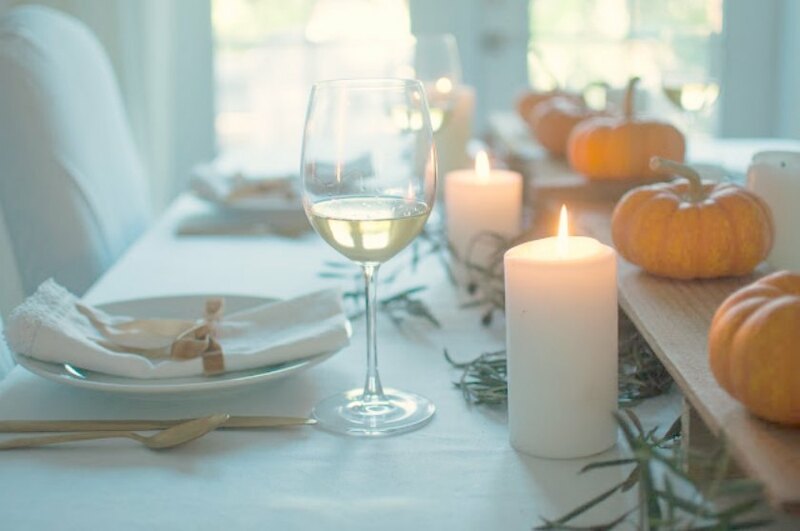 Because I haven’t done a single thing to mine so let’s decorate together, shall we? 1. 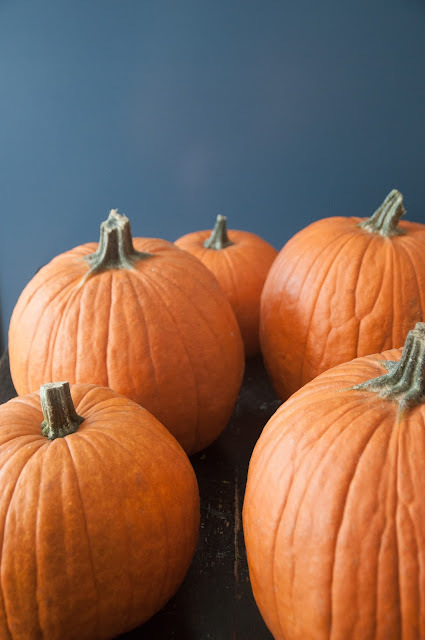 First the pumpkins. 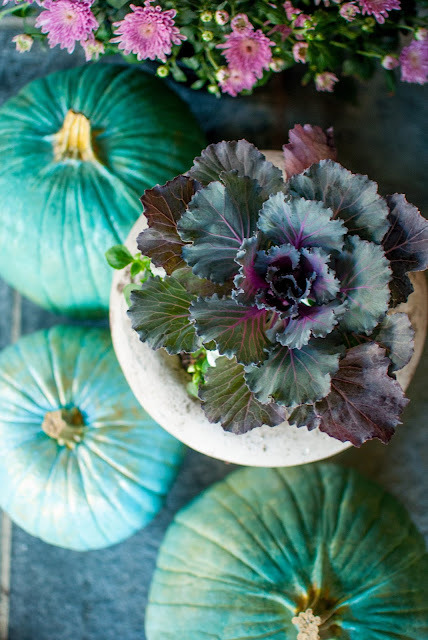 Instead of the typical orange pumpkins (which I love) I thought we needed something a little more ooh-la-la. 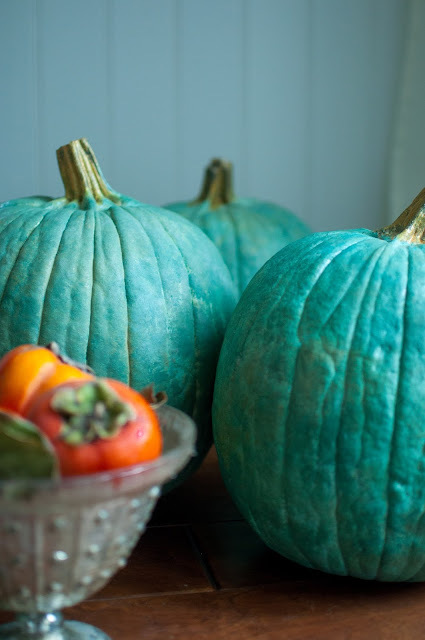 So I decided to paint gilded pumpkins with an Old World vibe…. 2. 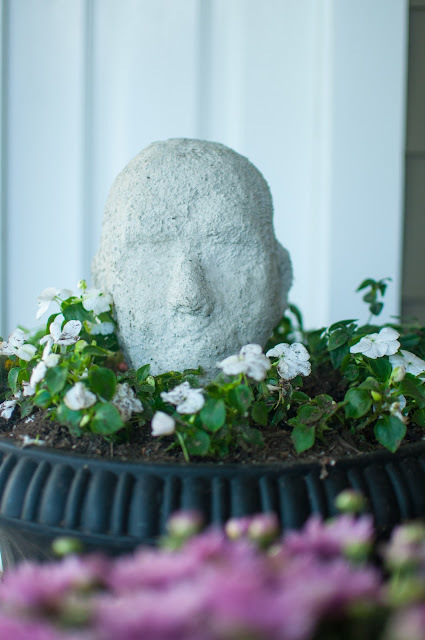 Number two on the list is a concrete garden sculpture for my matching urns. Because when I think about classic European homes I envision those moss-tinged garden statues that add a sense of history and stately elegance. 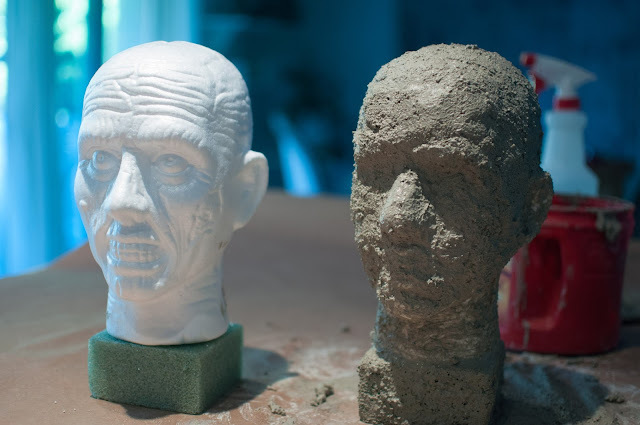 And because I love a good DIY opportunity I thought I’d show you how to make your very own concrete statue. For my French-inspired front door I chose to add a Gothic touch in honor of Halloween, a holiday that brings out the Lucy in me. But you could pick out a simple Styrofoam ball for your urn. 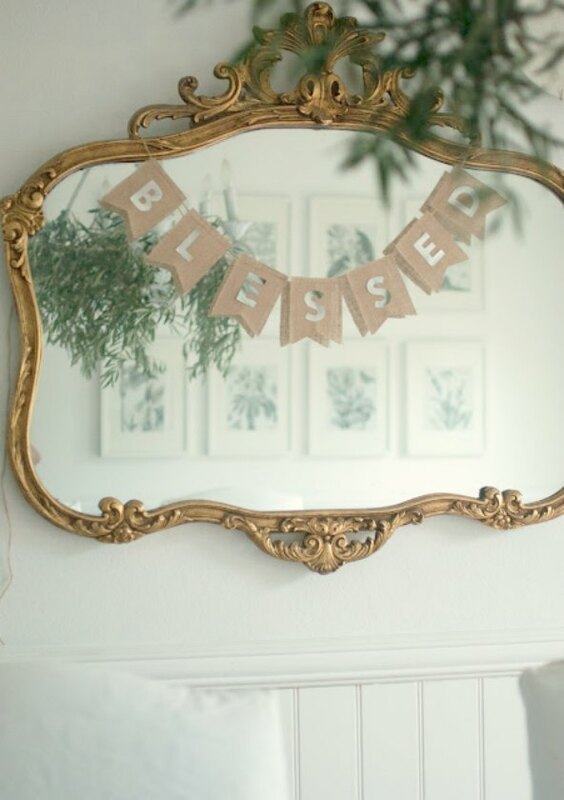 My motto for my DIY projects is always, “If I can do it….you can too!” And I really mean that. 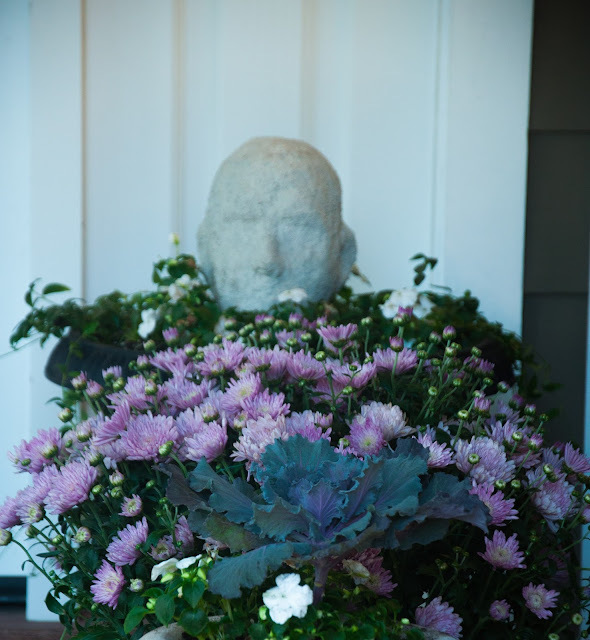 You can see my garden statue tutorial here. …this was literally a piece of wood from a pile on the side of my house. 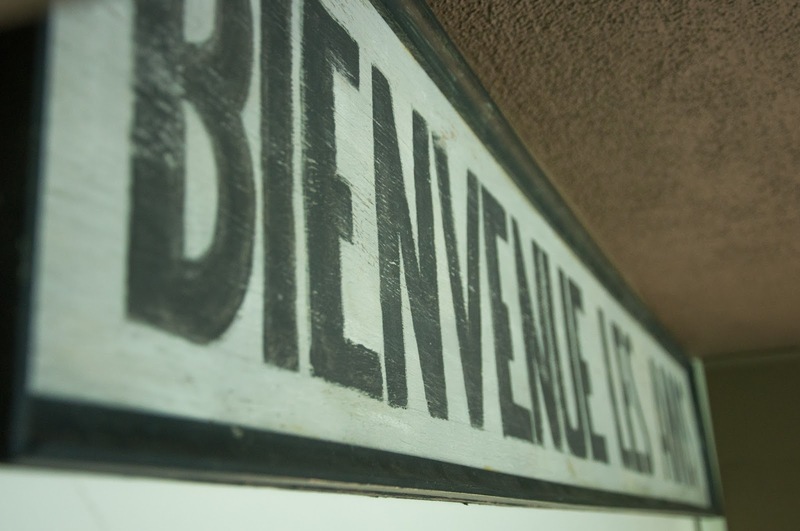 Please if you speak French and my sign DOES NOT say “Welcome friends” do not tell me. I had to Google a French translation site and my fingers are crossed. 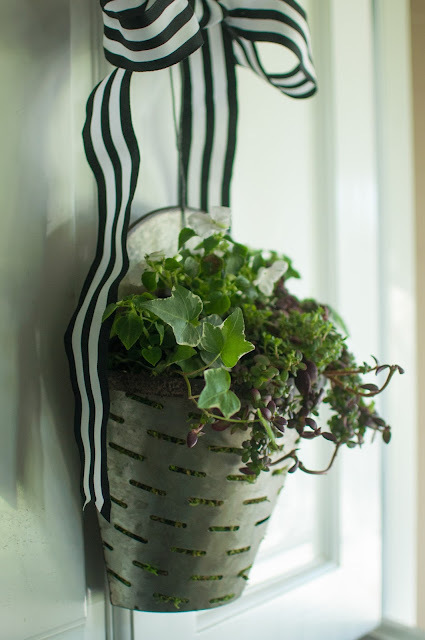 On the door I hung an olive bucket I lined with moss and filled with succulents, ivy and white annuals. And now…I think that’s my three tips. 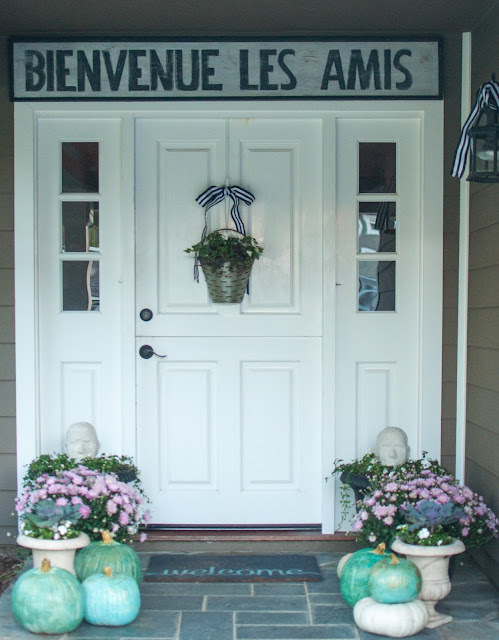 My French inspired Fall door. I only wish you could see these muted colors in person, it all looks so pretty for Fall. Well, I hope I inspired you to add a touch of French to your own entry, feel free to ask me any questions about these projects. And thanks Michele for your invitation, it was so fun to be here today. You’re amazing, Leslie! Thanks for your creativity and heartfulness. I’m Leslie’s guest on Gwen Moss — do stop by! 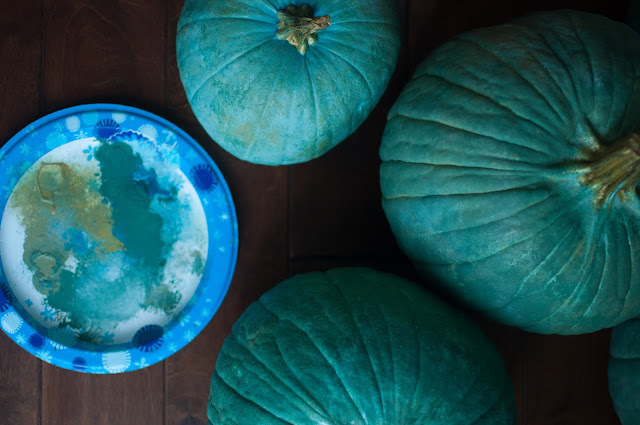 Leslie is an incredible soul and I am in LOVE with those pumpkins! Beautiful post! Oh. Thank you Joan. You know I feel the same way about you, my sweet friend. Adore Leslie. Always a breath of fresh air visiting her blog. 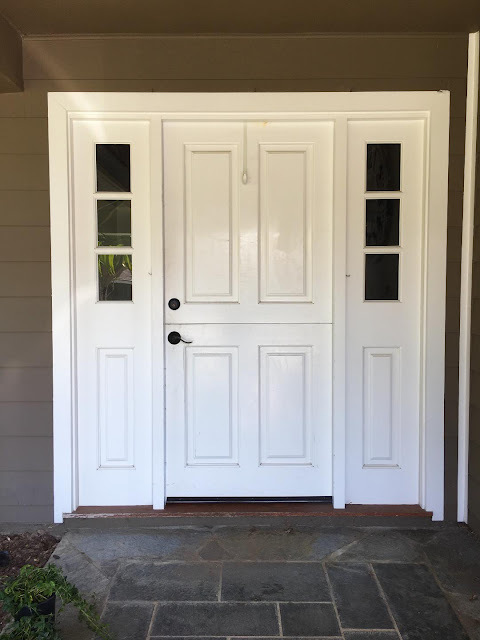 Leslie, your front entry looks amazing. 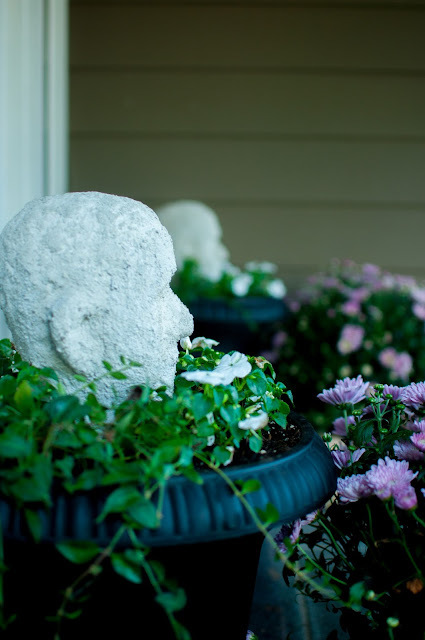 Love the touch of whimsy the DIY garden statues add. Charm Charm Charm….your posts & you…so sweet. It’s so nice to meet you, Michele! Great to meet you, Linda. I’m obsessing now about your white vintage toy truck with the pumpkins! Perfect! 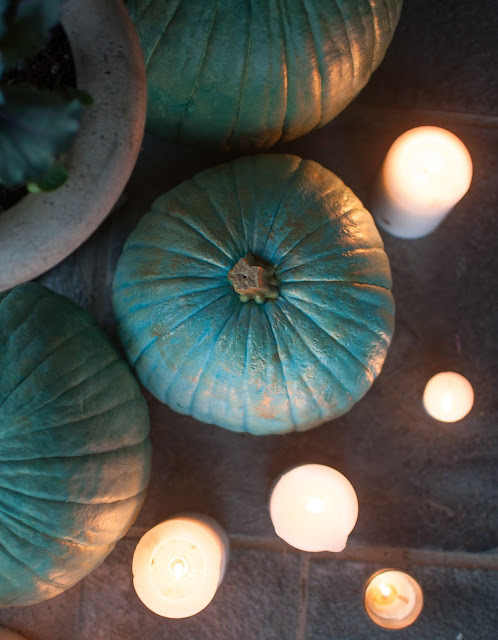 Love the turquoise pumpkins. Gold leaf is always fabulous. She added so much Frenchie charm!